FILE - Migrants who attempted to sail to Europe sit on the shore after their boat was intercepted at sea by the Libyan coast guard in Khoms, Libya, May 6, 2015. The EU’s commissioner for migration says Brussels may withhold development aid and impose trade and visa restrictions on migrant-source countries in Africa and Asia to force them to take back failed asylum-seekers. He said countries which failed to cooperate with repatriations could face blanket visa restrictions. Germany recently threatened to withhold visas from the ruling elites of migrant-source countries that do not accept returnees. But Avramopoulos appeared to indicate a much broader visa embargo is now being contemplated, saying “thousands of foreigners, from diplomats and doctors to students and researchers” would be impacted by the travel restrictions now under discussion. “The EU is not afraid to make use of leverages in trade or visa policy. Let’s be honest: it is neither good for Africa nor for Europe that so many people cross the Mediterranean,” he said. 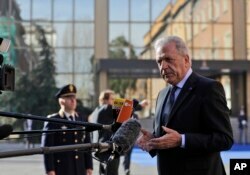 FILE - EU Migration Commissioner Dimitris Avramopoulos answers reporters' questions as he arrives for a meeting of interior ministers of the central Mediterranean contact group on migration in Rome, Italy, March 20, 2017. This is the first time EU commissioners have threatened to block access to European markets in response to a long-running migration crisis that’s roiling the continent and threatening to upend traditional party politics and empower populist nationalists. The “hard borders” approach now being considered is being condemned by humanitarian NGOs, which often embrace a “no border” ideology. On Monday, President Emmanuel Macron of France will chair talks featuring European and African leaders in Paris in a renewed bid to thrash out a more effective strategy to stem migrant flows. African leaders are likely to argue they need more development aid. The following day EU national leaders will hold one of their regular summits in which the migration issue will figure prominently. Both Italy and Germany have national elections in coming months and Italy’s Paolo Gentiloni and Germany’s Angela Merkel will likely want to show voters they are shutting down migrant routes. Italy will push the EU to try to replicate with Libya a deal that was struck with Turkey last year, which largely shut down the migrant route through the Balkans. But analysts say such a deal would be unworkable when it comes to Libya given the lack of an effective central authority in the northern Africa state. FILE - Migrants wait to disembark from a ship as they arrive at Crotone harbor, after being rescued by a "Save the Children" crew in the Mediterranean sea off the Libyan coast, in Crotone, Italy, June 21, 2017. Italy’s right-wing Forza Italia party has campaigned for the denial of landing rights to NGO ships carrying migrants. And even the maverick radical Five Star Movement is moving to an anti-immigrant position, calling for a halt to any new migrants being lodged in Rome. Gentiloni has accused fellow EU nations of “looking the other way,” and not doing enough to assist Italy with the surge in migrants crossing the Mediterranean. A burden-sharing system across the EU has failed with just a few thousand taken off Italy’s hands by other EU member states. Libya has become the main gateway to Europe for migrants and refugees from across sub-Saharan Africa, and also from the Arabian Peninsula, Egypt, Syria and Bangladesh. Many are fleeing war and persecution, but most who are using Libya are seeking to escape poverty. Italy has become the main point of arrival of those rescued off the coast of Libya. As the economic migration has grown, with only a small proportion of asylum-seekers coming from countries engulfed in war, so sentiment in Italy has shifted with Italians becoming enraged at the strain the influx is having on the country’s migrant facilities, which are now all full, and the appearance of migrants even in far-flung villages. FILE - Women are seen as they are held in the Ponte Galeria detention center for migrants near Rome, May 6, 2017. This week, police evicted more than a hundred Eritreans and Ethiopians from an abandoned office building near Rome’s central railway station. The occupants — who had been given refugee status — complained that Italy doesn't help asylum-seekers integrate, fails to house them and provide language classes. In fact, the Italian authorities do, housing many in villages across the country, providing months-long language tuition and up to 45 euros a day per refugee. But many refugees bolt the system, preferring to live in large cities such as Rome, Naples, Milan and Bologna and to try their luck. The sheer numbers — more than 600,000 asylum-seekers have entered Italy since 2014 — are overwhelming. And the assistance asylum-seekers do receive is increasingly infuriating ordinary Italians in villages migrants are sent to for temporary periods. “I don’t get that money from the government and we are struggling as well — we don’t have enough jobs for our kids and now migrant kids will be competing for the few jobs that are around,” says Anna-Maria Bianchi, a mother-of-two from a Lazio village just north of Rome. The only good news as far as Italian authorities are concerned is that there has been a fall-off in the rate of new arrivals this August and July. Official figures show arrivals in Italy from North Africa dropped by more than 50 percent in July from a year earlier and August arrivals are down even further, according to the International Organization for Migration. The decline is being put down to several factors — from changeable sea conditions to a heightened Libyan coastguard presence and a reduction in humanitarian rescue-refugee operations. There are also several probes by Italian authorities, who say NGOs have been colluding with people-traffickers.